If you’re looking to provide identity protection to your business personnel and clients then CSID’s identity theft monitoring technologies might come in useful. From the company that previously brought you IdentityTruth, CSID utilises their knowhow and service standards to provide a new system, although it still honours the contracts of Identity Truth customers, should you be one. It is based in the US and available only to US users, that employs some of the best technology to get a complete picture of your individual identity fraud risk. Identity Truth describes the service it offers as being 'faster than fraud', allowing users to be warned far in advance of any potential risk to their identity and financial security. 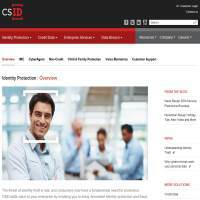 CSID’s primary features are concerned with protecting identities. The best of these features is the Identity Management Center, which is a hosted platform that allows you to fully manage your identity by tracking and monitoring any changes. Meanwhile, the CyberAgent allows you to identify and react to potential risks to limit the potential impact of any data lost. You can also provide your customers with protection for non-credit identity information. It does this through online surveillance of websites, blogs, bulletins, sharing networks and chat rooms. It can also be programmed to your specifications, if needs be, making it fairly flexible. As well as this you can also provide clients with voice biometrics options, so that they can simply speak to access their account. The great benefit of this is that it cannot be guessed at or hacked using conventional means. Users construct an individual 'Identity Profile' with Identity Truth, depositing with them a full list of all sensitive information that is to be protected. Users of Identity Truth can be confident of the security measures undertaken by Identity Truth in order to protect the information that is deposited with them - computer systems are regularly examined and tested by McAfee internet security, and all staff that work for Identity Truth are subject to rigorous background checks to ensure that they are suitable to work with sensitive user information. Once a user has constructed their 'Identity Profile' they can check out their dynamic ID health score, which gives an indication of their level of risk of becoming a victim of identity theft. Identity Truth can then assess what measures need to be undertaken in order to ensure that any potential breaches in security are dealt with. Users can apply fraud alerts on all of their credit accounts to ensure that any new applications or large transactions will need prior agreement by the user using a 'safe phone number'. The site’s other major focus is on data breaches and mitigation. This is essentially damage limitation, which could be very important if your business holds personal information that you don’t want leaking. If the worst happens and your information should become compromised then you’ll want to recover it as quickly as possible by intercepting it at the source and stopping further attacks. CSID also provides a Global ID Protector, which it claims is “the only comprehensive identity protection solution that can be offered on an international scale”. If you’re a multinational company then this seems like a good choice. You can also opt out of junk mail registers and the pre-approved credit records, so that not only are you free from having to endure endless annoying offers of credit cards (and other financial products), but another avenue for credit fraud is closed down (as ID thieves often use fake credit offers to obtain identifying details). Despite its claims the site itself doesn’t offer many specific details as to how it goes about protecting data, or indeed what its services are exactly. Prices are also a mystery and you can only find out the potential cost by making an inquiry. To add insult to injury, you can only contact them via phone (they don’t provide international numbers), or by filling in an online form and waiting for a response. It’s hardly the top notch information we’d expect from a company that is selling ID protection on an international scale, but there you are. Perhaps with this necessary information CSID will turn out to be a superior identity theft protection service for a reasonable price. It really does need to step up its game in terms of information and customer service, though, which seems way behind some of the big hitters in this category.